This cupcake photo holder is part of Deb's Party collection commemorating their 30th year in business! 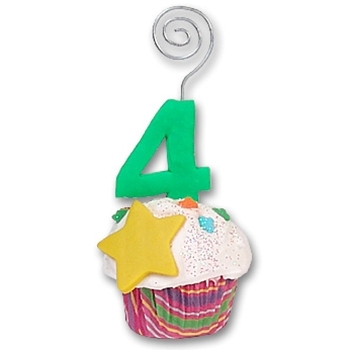 This is the perfect gift for a child celebrating his or her FOURTH birthday. It is also a wonderful gift for anyone celebrating a FOURTH anniversary. It may be easily personalized with a name, year or event As always personalization is FREE! May be used as a photo holder or a place card holder. The cupcake is lovingly handcrafted from polymer clay, has just a touch of glitter and designed by Debi Allison. It comes attractively packaged in a clear acrylic decorated box, perfect for gift giving!